It’s been 50 years since he passed away. Now, during the year that also marks the 110th anniversary of his birth, let us rediscover his work. 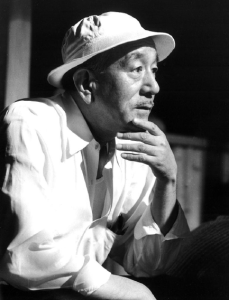 The Japanese still think of Ozu as the most Japanese of all of Japan’s filmmakers. He may not be everyone’s favourite, but he is the one who has received the most awards. Ozu is a representative of the country, possessing the true ‘Japanese touch.’ Talking about the ‘Japanese touch’ is a relevant point to make, because Japan is extremely self-aware of its identity.” These words from the American critic Donald Richie really capture the place that Ozu Yasujirô holds in Japanese history – and not just the history of its cinema. Although many young Japanese people today don’t know the first thing about the films he created throughout the course of his career, the work of a director does serve as an ideal documentary tool for understanding the evolution of Japan before and after World War II. Donald Richie knows how to explain why. “The figure of Ozu is one of the most recognizable in cinema. His character is the protagonist and is not subject to the external stresses of a plot. He is just himself; a truly rare spectacle. We watch the unfolding of his existence with the joy that absolute realism always inspires, fully aware of a human being’s beauty and fragility,” he wrote in his admirable Ozu (1980). Through the many characters he directed in his most famous film, Tôkyô Story (Tôkyô monogatari, 1953), he illustrates the transformation of his country and how family relationships, in particular, change. He focuses on the breakdown of the family that nowadays reflects deep-rooted social unease and a need to build groups that one can identity with. In Japan, identification with one’s family (or with a specific group, nation, school, or company) is essential to one’s own identity. In his work, Ozu illustrates how the family gradually disappears. But the harm is limited to certain characters in the form of solitude, like the father who finds himself alone in the middle of a room after his daughter’s marriage or his wife’s death, because at the time he directed his films, a sense of belonging to schools and companies allowed the individual to exist. But, since the beginnining of the 1990s the school system has collapsed and companies have lost their appeal since, thereby reaching the culmination of a cycle that Ozu captured and chose to analyse as simply as possible. It’s all the more interesting to know that the director died in December 1963, several months before the Olympic Games were held in Tokyo in October 1964, representing a major turning point. The Olympic Games marked the beginning of Japan’s comeback into the fold of nations and the beginning of its confirmed status as an economic power. With their double-digit growth and the society’s growing prosperity, the Japanese opened a new chapter of their history that Ozu glimpsed in many of his films. So it’s particularly interesting to watch them, or even watch them again. In Japan this year, Shôchiku chose to present restored versions of four of his colour films, including An Autumn Afternoon (Sanma no aji, 1962), which was also presented at the Cannes Film Festival in Cannes Classics 2013. Other events in Ôsaka, Tôkyô and Kamakura, where he lived, or even in Onomichi, the starting point of Tôkyô Story (see Zoom Japan, no. 27, February 2013) are planned throughout the coming months. It’s a great opportunity to familiarize yourself with truly Japanese works and to discover “this cinemagraphic art whose formalism is comparable to that of poetry.” In Ozu’s cinema, you find the sensitivity and humanity that seem to have been forgotten for years in our wealthobsessed societies. At a time when people dare to talk about a shrinking economy, perhaps we should respond by immersing ourselves in these works that were achieved not with unlimited resources, but rather a real wish to lead the viewer to a better understanding of the world that surrounds him.